I’ve been dying to get my hands on Morphite ($7.99), the new action adventure title from developers Crescent Moon Games, Blowfish Studios, and We’re Five Games, ever since I gazed upon its luscious low-poly environments when it was originally announced back in May of last year. It’s been a long year and a half wait, but finally Morphite has landed its dropship directly onto the surface of planet App Store. Ok that was a super cheesy line but I don’t care, Morphite is here! To coincide with the launch of Morphite on the App Store the developers have put together a brand new launch trailer showing the game in action, check it out! We’ve covered Morphite a bunch over the past 16-ish months, and it’s easily become one of the most highly-anticipated titles in our community. I played a wee bit of an in-progress version of the game when it was in beta, and I REALLY enjoyed it. This is the type of game that you’ll enjoy more if your expectations are set appropriately. For example, many have taken Morphite’s colorful visuals and how you travel from planet to planet to mean that it’s trying to be a portable No Man’s Sky. There certainly are some similar aspects, but the scope of Morphite is definitely not on par with something like No Man’s Sky, nor was it ever trying to be. What Morphite is greatest at is offering up visually interesting environments to explore supplemented with some light first-person shooting action, some surprisingly engaging plant and animal tracking, and a pretty entertaining main storyline to follow along with. 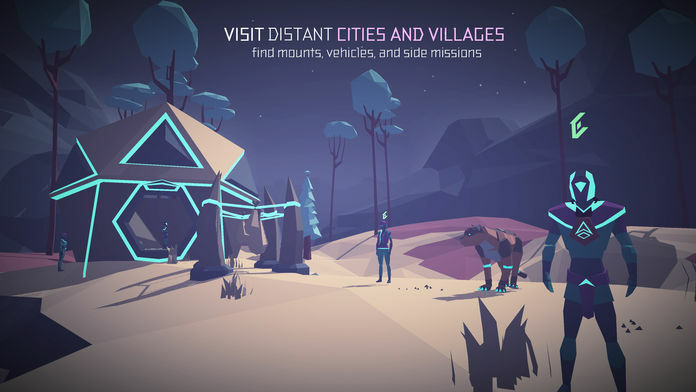 If you’re the type that enjoys getting lost exploring all the weird nooks and crannies in a huge open-world game just to see what’s there, Morphite offers a similar satisfaction but sliced into more manageable open-world chunks in the form of procedurally-generated planets rather than just one big open world. The way you traverse between its massive map of planets is also very cool and reminiscent of the excellent Out There ($3.99). You’ll need to plan for each trip based on your amount of fuel and your ship’s health, which may require you making a stop off at a closer planet to gather up some resources before heading to your intended planet for mission purposes. It’s all very cool, and I think as long as people know what they’re in for with Morphite it’s going to end up being a major hit on the mobile platform. The game is available now for $7.99 from the link below and you can scope out all the impressions and discussions that will no doubt be arriving throughout the day in Morphite’s forum thread.